U.S. Air Force Academy cadets from Cadet Squadron 35 pose for a group photograph at the Children Enrichment Center in Colorado Springs, Colorado, Oct. 4, 2018. The CEC supports Partners in Housing, an organization that provides transitional housing to homeless families, with free daycare for parents during on-site life skills classes. 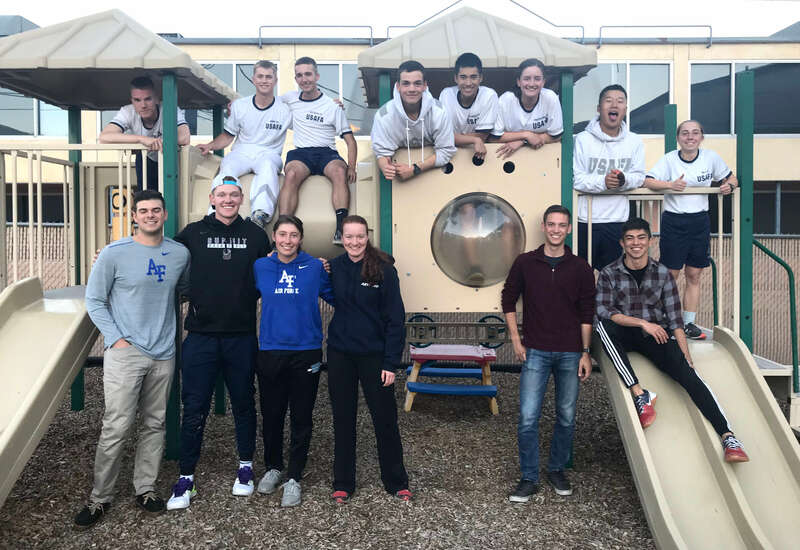 U.S. AIR FORCE ACADEMY, Colo. – Over the course of a few hours, children at the Child Enrichment Center in downtown Colorado Springs run, jump and play on a small playground with a group of Air Force Academy cadets, Oct. 4. It’s a scene of happy chaos: a jubilance that spreads from the kids to the cadets, who laugh and hoist them onto their shoulders and chase them in a lawless game of tag. The moment is poignant for the program runners at Partners in Housing, an organization that provides homeless families with transitional housing and life skills courses. “All of these children have experienced homelessness, but right now, if you look at them, they’re just kids,” said Karen Kantor, Partners in Housing development director. The CEC offers free daycare for the parents or caregivers in the program while they attend on-site life skills classes to help them become self-sufficient. These classes include budgeting, credit repair, resume writing and interview techniques. In March, cadets from the Cadet Squadron 35, reached out to the organization to volunteer. Cadet 2nd Class Hanna Guckenberg, an Eau Claire, Wisconsin native with a love for working with children, was one of the early volunteers. The CEC staff described the cadets as energetic, helpful, and important to creating a positive atmosphere for the children. “The cadets are successful, they’re committed, and they’re doing these things we want the kids to consider for their own future,” said Kantor. Kantor, an Army veteran, said she liked to think the cadets benefited from the time at the CEC just as much as the children. As the play session begins to wind down, the cadets join the children as they set off a paper mache volcano, cheering them on with as much enthusiasm as they would any one of the Academy’s sports teams.